It's such a good feeling: The Man Who Knew Too Much. Today, my lovely friends from upstairs invited me to Chinese food them with. We went, we had a good time, we ate yummy food. Then, we went up to the register to pay. The Asian young man behind the counter said to my friend in front of me, "$10.66." 1066? Why does that sound familiar? Then I remembered, and said to no one in particular, "1066 was the year of the Battle of Hastings." "People say that all the time." Actually, my initial thought was, "How often is $10.66 the total?" But it can't be all the time. You know? And of all the times the total is $10.66, how often do the people know that's the year of the Battle of Hastings? Or if they know, how often do they think of it when they hear "$10.66"? Or if they think of it, how often do they say it out loud? I would have never known. That is really funny. 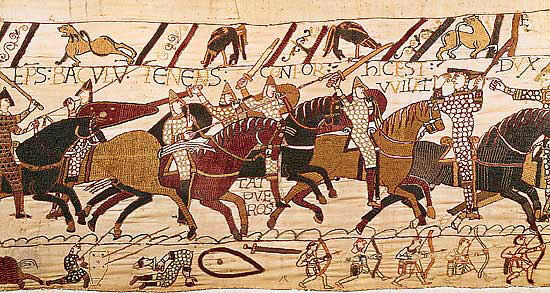 I know nothing about the Battle of Hastings, but my first thought to his response was, "What dish do they serve that's always $10.66?" I just want you to know I thought of it. Thank you AP European History. Whitey, can you spot me some blackjack cash?